Selina Swan, Wunan Board member, has been nominated for the Telstra Business Women’s Awards. The Awards celebrate the extraordinary achievements of inspirational women in business. The opportunities for finalists and winners can be life-changing, through mentoring, speaking roles and networking with an elite alumni community. Read More. Wunan Executive Chair Ian Trust has been named as one of nineteen finalists for the 2013 Western Australian of the Year Awards. The finalists are being recognised for their outstanding achievements across six categories, with Ian selected in the Indigenous Award category. More details on Ian’s achievements can be found on the Celebrate WA website: http://www.celebratewa.com.au/pages/5833/indigenous-award-finalists Read More. Wunan has recently completed an analysis of the 2011 Census to ascertain the state of Aboriginal wellbeing in the East Kimberley. After the 2006 Census, Wunan set a goal of reducing welfare dependency in the region’s Aboriginal population from 80% to 20% over 20 years. Over the past five years, this headline figure has improved from 80% to 75%; slow progress given there has been significant new economic activity in the region. The East Kimberley Aboriginal population has also recorded slow progress in other key areas since 2006: 20 to 24 year olds with a year 12 or equivalent qualification has improved from 22% to 31% 15 to 64 year olds who are employed in a real job has improved from 21% to 26% households with more than two people per bedroom has decreased from 25% to 20% private housing market participation has increased from 14% to 21%. While these […] Read More. 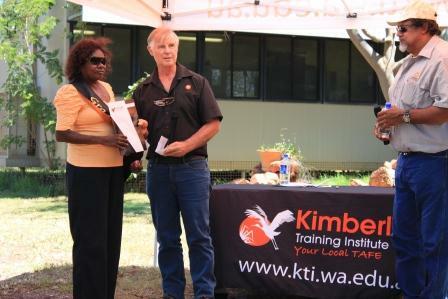 The Kimberley Training Institute (KTI) Halls Creek campus graduation ceremony was held at the campus on Friday 22 March. It was the first time KTI held an official graduation in Halls Creek. KTI Regional Manager Rosemary Taffinder said that the support from community and town was outstanding. “Both the students, staff and the community really appreciated being able to have a graduation in Halls Creek. It was a terrific opportunity to acknowledge the students and the hard work they put into completing their qualifications” she said. The KTI Halls Creek campus student of the year prize, sponsored by the Wunan Foundation was awarded to Marlene Skeen, a General Education student. Marlene was nominated by her lecturer Madeleine Bromley because of her commitment to her studies and her ability to take challenges in her stride. She participates fully in class activities, is consistent in her attendance and her work is always […] Read More. Robert Reichel has a vision for the Ningkuwum-Ngamayuwu Aboriginal children and family centre he manages at Halls Creek, a small town in the East Kimberley region of WA. “We want this to be a family-friendly place that people feel comfortable in attending to get a range of services and help — what we’re trying to deliver is an integrated model,” says Robert. “To make sure that when an Aboriginal person walks in the door, no matter who they are or what place they come from, that without them leaving, they can get the help they need.” The children and family centre at Halls Creek has been operating since January 2012. It is one of 38 new Aboriginal and Torres Strait Islander children and family centres being established across the country by the Australian Government in partnership with state-territory governments. The centre is a joint venture between the Wunan Foundation — […] Read More. Tammy joined the Living Change team as Design Lead in January 2012, having relocated from Cairns, Queensland with her family. Prior to joining Wunan, Tammy was Registrar of the Family Responsibilities Commission, the cornerstone of the Noel Pearson-led Cape York Welfare Reforms. Tammy brings the experience of leading (together with the Commissioner) the creation, implementation and operation of a unique, independent statutory authority, led by local Indigenous Elders, that was established to restore the social and cultural fabric of four discreet Indigenous communities in Cape York, Queensland. Read More.